After 13 rounds of top level chess, we have reached the final round of “The Candidates 2014” in which we have the pairings: Anand-Svidler, Aronian-Karjakin, Topalov-Andreikin and Mamedyarov-Kramnik. A quick sidestep to a running gag on Twitter about the #comfyshirt: “Anand’s lucky shirt is national treasure.Hope we have our best intelligence to stop the Norwegians frm”, tweeted @BalaajiM. No comfyshirt today for Anand: Anand wearing suits today like a WC challenger, tweeted @BekMirahmedov. I guess that these comfyshirt or lucky shirt tweets were initiated by a tweet of your blogger:-)) In the first round I watched the game Anand-Aronian, recognized the shirt Anand was wearing and tweeted: “Trivia: @vishy64theking wears his lucky shirt. He wore the same shirt in his game against @LevAronian in Tata 2013. He won”. To the games: One of the most indefatigable tweeters during the Candidates is here to comment the first moves: @reachvsara:“Vishy has taken it easy, mass exchanges from a Marshall, retire early for meal with Sandipan Chanda #DinnerAfterStorm“. @rajachess: “Anand is better and even if he draws he will find an exact moment when nobody else is giving press-conference”. The game did not take very long. After 34 moves and 90 minutes of play, Anand and Svidler finished their tournament. @dilipvanaman: “Vishy secures 8 1/2 points/14 rounds. Coincidence ? 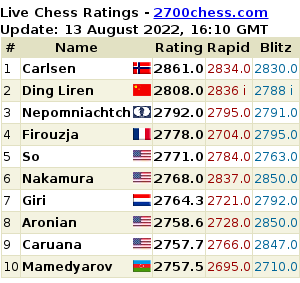 Same points as @MagnusCarlsen in the 2013 Candidates”. @bandrinath: “+3 – 0 = 11. Who would have thought? A polite slap to all those who said “he” is over! !” @unudurti: “In effect, Anand needed only 6 Whites. Respect”. Not long after the Baden Baden teammates Anand and Svidler agreed to a draw, there was another quick draw: @ChessVibes: “Vladimir Kramnik and Shakhriyar Mamedyarov just finished their #Candidates2014 Tournament with a draw. @MarkTWIC: “Topalov draw Andreikin. Topalov one of many who need to go away and think after a disappointing result.” @susanpolgar: “Topalov drew and assured of last place. Who would have thought? Wow!”. Finally! We had to wait three weeks for the “wow”. And Karjakin won the last game, after 7 (!) hours of play: @pogonina: “Aronian – Karjakin 0-1.Game of the day today, a rollercoaster. Sergey clinches clear 2nd place”. “@SergeyKaryakin is the Rahul Dravid of chess.. very patient and boring..but also very efficient :)”, according to @gultistan. “Very much impressed by @SergeyKaryakin …already can see a future on board rivalry with @MagnusCarlsen“, tweeted @pranavdes. @unudurti: “Our thanks to all the fine folks who worked behind & in front of the scenes in Khanty-Mansiysk!It has been a great few weeks”. @asimpereira: I think two people have given their best performance in the Candidates, Anand and Peter Nielsen! Nice commentary! And if you want to know more about the people behind the scenes, go here. Previous PostThe Candidates in tweets – round 13Next PostCongratulations, Vishy!